"On change of revenue from Scott County a transcript was filed in the Circuit Court here yesterday in a divorce proceeding of George W. Seaver against Rosa E. Seaver. 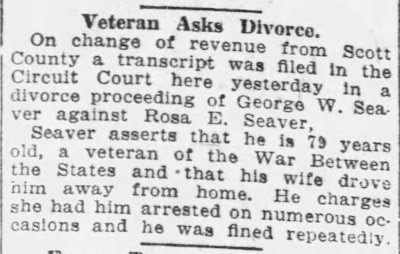 "Seaver asserts that he is 79 years old, a veteran of the War Between the States an that his wife drove him away from home. He charges she had him arrested on numerous occasions ad he was fined repeatedly." 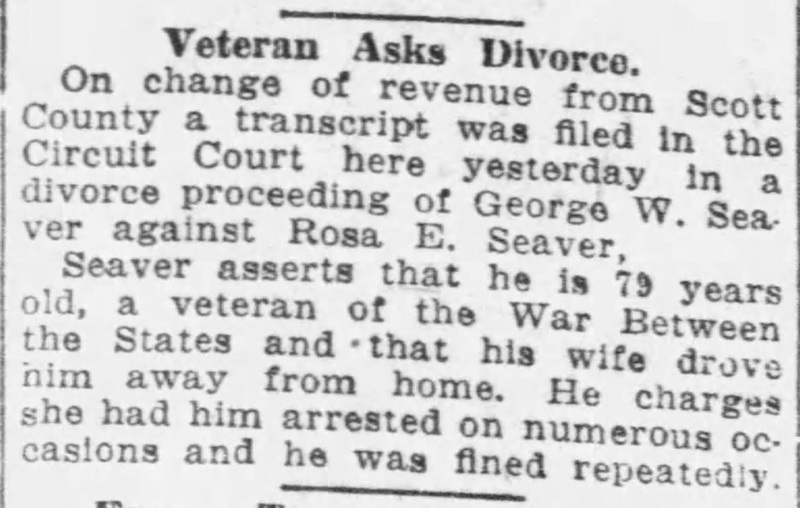 "Veteran Asks Divorce," The Courier-Journal [Louisville, Ky.] newspaper, article, Thursday, 14 February 1924, page 5, column 2, George W. Seaver divorce article; Newspapers.com (https://www.newspapers.com : accessed 11 April 2019). George Washington Seaver (1844-1937) was born and died in Jennings, Scott County, Indiana, the son of Daniel and Julia (Holcomb) Seaver. He married, secondly, Rosala Frances Foster (1865-1944) in 1880, and they had 12 children. To my knowledge, I am not related to George. I don't know the parents of Daniel Seaver (born in 1801 in New York, died 1869 in Indiana), although he may be from the New England branch from Robert Seaver (1608-1683).